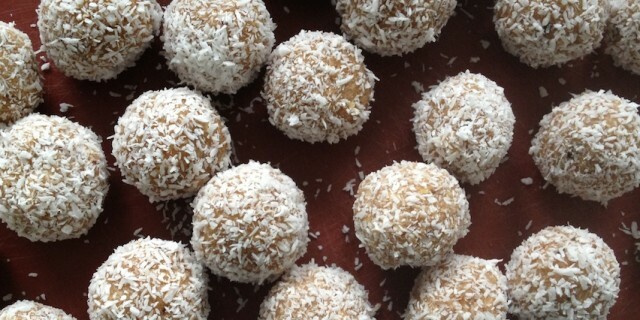 These Coconut Bounty Balls are delicious and they are good for you too! I made these today for a team meeting at Delight Yoga, the studio I teach yoga at. Considering they were gone in under a minute and people were licking their fingers after taking their last bite, I can say they are a huge success. I love chocolate, I love nuts, I love coconut and I am pretty much in love with being healthy and feeling the best I can while simultaneously enjoying life (and food) to the fullest. These Coconut Bounty Balls offer a healthy alternative to a bar of your favourite chocolate, a real Bounty bar or any other kind of high-sugar snack. They also make a great energy snack or pre-workout snack as they provide nourishment and sustainable energy. What’s great about them is that you can make them very quickly. No cooking required, just a food processor. Enjoy! Add all ingredients, except for the coconut flakes and almond flour, to a food processor. Process until you have a smooth consistency but still have crunchy bits of cashew nuts and cacao nibs. Add mixture to a large bowl and use your hands to mix 1,5 cup of the shredded coconut in. Flour the bowl with coconut flour and gently mix it in with your hands, until the mixture can hold itself together and is not sticking to the bowl or your hands. You can add more coconut or flour, if necessary, but the mixture should remain relatively soft and slightly gooey. Add the rest of the shredded coconut to a small bowl. Roll the mixture into small balls and then roll them around in the coconut, until covered on all sides. Add them to a large container that you can cover and place in the freezer later on. When all balls are covered in coconut, you can place the balls in the freezer and take them out whenever you want to eat them. They will keep for at least a few weeks. They won’t freeze solid so they are easy to grab on the go or whenever you need just that little bit of energy.